This article is about the Jupiter probe. For the navigation satellites, see Galileo (satellite navigation). For for the Star Trek shuttle, see Galileo (Star Trek). Artist's concept of Galileo at Io; the high-gain antenna is fully deployed. Galileo was an American unmanned spacecraft that studied the planet Jupiter and its moons, as well as several other Solar System bodies. Named after the astronomer Galileo Galilei, it consisted of an orbiter and entry probe. It was launched on October 18, 1989, carried by Space Shuttle Atlantis, on the STS-34 mission. Galileo arrived at Jupiter on December 7, 1995, after gravitational assist flybys of Venus and Earth, and became the first spacecraft to orbit Jupiter. It launched the first probe into Jupiter, directly measuring its atmosphere. Despite suffering major antenna problems, Galileo achieved the first asteroid flyby, of 951 Gaspra, and discovered the first asteroid moon, Dactyl, around 243 Ida. In 1994, Galileo observed Comet Shoemaker–Levy 9's collision with Jupiter. Jupiter's atmospheric composition and ammonia clouds were recorded, the clouds possibly created by outflows from the lower depths of the atmosphere. Io's volcanism and plasma interactions with Jupiter's atmosphere were also recorded. 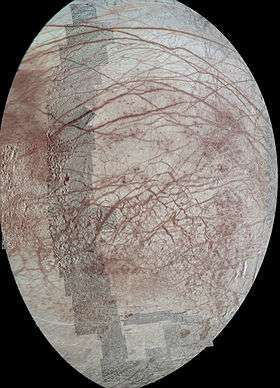 The data Galileo collected supported the theory of a liquid ocean under the icy surface of Europa, and there were indications of similar liquid-saltwater layers under the surfaces of Ganymede and Callisto. Ganymede was shown to possess a magnetic field and the spacecraft found new evidence for exospheres around Europa, Ganymede, and Callisto. Galileo also discovered that Jupiter's faint ring system consists of dust from impacts on the four small inner moons. The extent and structure of Jupiter's magnetosphere was also mapped. On September 21, 2003, after 14 years in space and 8 years in the Jovian system, Galileo's mission was terminated by sending it into Jupiter's atmosphere at a speed of over 48 kilometers (30 mi) per second, eliminating the possibility of contaminating local moons with terrestrial bacteria. Jupiter was rated as the number one priority in the Planetary Science Decadal Survey published in the summer of 1968. In the early 1970s the first flybys of Jupiter were achieved by Pioneer 10 and Pioneer 11, and before the decade was out it was also visited by the more advanced Voyager 1 and Voyager 2 spacecraft. Work on the spacecraft began at Jet Propulsion Laboratory in 1977, while the Voyager 1 and 2 missions were still being prepared for launch. 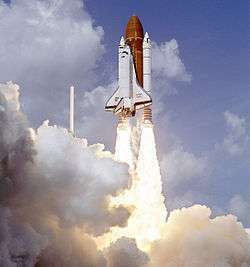 Early plans called for a launch on Space Shuttle Columbia on what was then codenamed STS-23 in January 1982, but delays in the development of the Space Shuttle allowed more time for development of the probe. As the shuttle program got underway, Galileo was scheduled for launch in 1984, but this later slipped to 1985 and then to 1986. 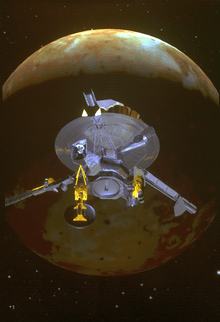 The mission was initially called the Jupiter Orbiter Probe; it was christened Galileo in 1978. 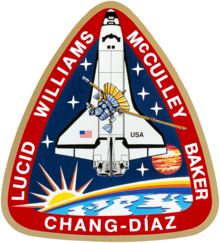 Once the spacecraft was complete, its launch was scheduled for STS-61-G on-board Atlantis in 1986. The Inertial Upper Stage booster was going to be used at first, but this changed to the Centaur booster, then back to IUS after Challenger. The Centaur-G liquid hydrogen-fueled booster stage allowed a direct trajectory to Jupiter. However, the mission was further delayed by the hiatus in launches that occurred after the Space Shuttle Challenger disaster. New safety protocols introduced as a result of the disaster prohibited the use of the Centaur-G stage on the Shuttle, forcing Galileo to use a lower-powered Inertial Upper Stage solid-fuel booster. The mission was re-profiled in 1987 to use several gravitational slingshots, referred to as the "VEEGA" or Venus Earth Earth Gravity Assist maneuvers, to provide the additional velocity required to reach its destination. The Galileo (black) aboard Atlantis ready for launch toward Jupiter. Attached to it, the small rocket Inertial Upper Stage (white). It was finally launched on October 18, 1989, by the Space Shuttle Atlantis on the STS-34 mission. 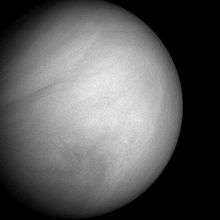 Venus was flown by at 05:58:48 UT on February 10, 1990 at a range of 16,106 km. Having gained 8,030 km per hour in speed, the spacecraft flew by Earth twice, the first time at a range of 960 km at 20:34:34 UT on 8 December 1990 before approaching the S-type asteroid 951 Gaspra to a distance of 1,604 km at 22:37 UT on 29 October 1991. Galileo then performed a second flyby of Earth at 303.1 km at 15:09:25 UT on 8 December 1992, adding 13,320 km per hour to its cumulative speed. 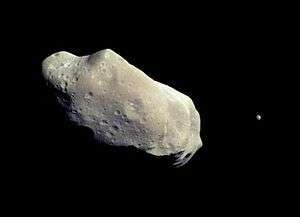 Galileo performed close observation of a second asteroid, 243 Ida, at 16:51:59 UT on 28 August 1993 at a range of 2,410 km. 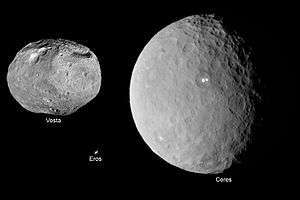 The spacecraft discovered Ida has a moon Dactyl, the first discovery of a natural satellite orbiting an asteroid. In 1994, Galileo was perfectly positioned to watch the fragments of the comet Shoemaker-Levy 9 crash into Jupiter, whereas terrestrial telescopes had to wait to see the impact sites as they rotated into view. After releasing its atmospheric probe on 13 July 1995, the Galileo orbiter became the first man-made satellite of Jupiter at 00:27 UT on 8 December 1995 when it fired its main engine to enter a 198-day parking orbit. Galileo's prime mission was a two-year study of the Jovian system. The spacecraft traveled around Jupiter in elongated ellipses, each orbit lasting about two months. The differing distances from Jupiter afforded by these orbits allowed Galileo to sample different parts of the planet's extensive magnetosphere. The orbits were designed for close-up flybys of Jupiter's largest moons. Once the prime mission concluded, an extended mission started on December 7, 1997; the spacecraft made a number of flybys of Europa and Io. The closest approach was 180 km (110 mi) on October 15, 2001. The radiation environment near Io was very unhealthy for Galileo's systems, and so these flybys were saved for the extended mission when loss of the spacecraft would be more acceptable. Galileo's cameras were deactivated on January 17, 2002, after they had sustained irreparable radiation damage. NASA engineers were able to recover the damaged tape recorder electronics, and Galileo continued to return scientific data until it was deorbited in 2003, performing one last scientific experiment —a measurement of the moon Amalthea's mass as the spacecraft swung by it. 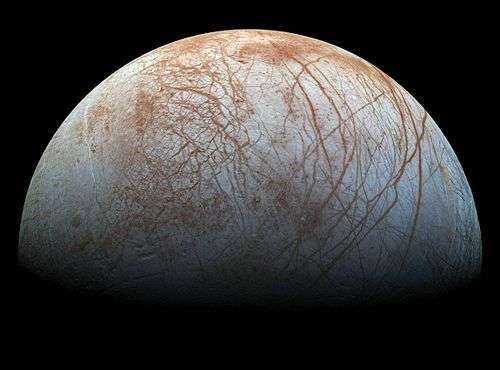 On December 11, 2013, NASA reported, based on results from the Galileo mission, the detection of "clay-like minerals" (specifically, phyllosilicates), often associated with organic materials, on the icy crust of Europa, moon of Jupiter. The presence of the minerals may have been the result of a collision with an asteroid or comet according to the scientists. The Jet Propulsion Laboratory built the Galileo spacecraft and managed the Galileo mission for NASA. West Germany supplied the propulsion module. NASA's Ames Research Center managed the probe, which was built by Hughes Aircraft Company. At launch, the orbiter and probe together had a mass of 2,564 kilograms (5,653 pounds) and stood seven metres tall. One section of the spacecraft rotated at 3 rpm, keeping Galileo stable and holding six instruments that gathered data from many different directions, including the fields and particles instruments. The other section of the spacecraft was an antenna, and data were periodically transmitted to it. Back on the ground, the mission operations team used software containing 650,000 lines of programming code in the orbit sequence design process; 1,615,000 lines in the telemetry interpretation; and 550,000 lines of code in navigation. The CDH subsystem was actively redundant, with two parallel data system buses running at all times. Each data system bus (a.k.a. string) was composed of the same functional elements, consisting of multiplexers (MUX), high-level modules (HLM), low-level modules (LLM), power converters (PC), bulk memory (BUM), data management subsystem bulk memory (DBUM), timing chains (TC), phase locked loops (PLL), Golay coders (GC), hardware command decoders (HCD) and critical controllers (CRC). The spacecraft was controlled by six RCA 1802 COSMAC microprocessor CPUs: four on the spun side and two on the despun side. Each CPU was clocked at about 1.6 MHz, and fabricated on sapphire (silicon on sapphire), which is a radiation-and static-hardened material ideal for spacecraft operation. This microprocessor was the first low-power CMOS processor chip, quite on a par with the 8-bit 6502 that was being built into the Apple II desktop computer at that time. The Galileo Attitude and Articulation Control System (AACSE) was controlled by two Itek Advanced Technology Airborne Computers (ATAC), built using radiation-hardened 2901s. The AACSE could be reprogrammed in flight by sending the new program through the Command and Data Subsystem. Galileo's attitude control system software was written in the HAL/S programming language, also used in the Space Shuttle program. Memory capacity provided by each BUM was 16K of RAM, while the DBUMs each provided 8K of RAM. There were two BUMs and two DBUMs in the CDH subsystem and they all resided on the spun side of the spacecraft. The BUMs and DBUMs provided storage for sequences and contain various buffers for telemetry data and interbus communication. Every HLM and LLM was built up around a single 1802 microprocessor and 32K of RAM (for HLMs) or 16K of RAM (for LLMs). Two HLMs and two LLMs resided on the spun side while two LLMs were on the despun side. Thus, total memory capacity available to the CDH subsystem was 176K of RAM: 144K allocated to the spun side and 32K to the despun side. The HCD receives command data from the modulation/demodulation subsystem, decodes these data and transfers them to the HLMs and CRCs. The CRC controls the configuration of CDH subsystem elements. It also controls access to the two data system buses by other spacecraft subsystems. In addition, the CRC supplies signals to enable certain critical events (e.g. probe separation). The GCs provide Golay encoding of data via hardware. The TCs and PLLs establish timing within the CDH subsystem. The Propulsion Subsystem consisted of a 400 N main engine and twelve 10 N thrusters, together with propellant, storage and pressurizing tanks and associated plumbing. The 10 N thrusters were mounted in groups of six on two 2-meter booms. The fuel for the system was 925 kg of monomethylhydrazine and nitrogen tetroxide. Two separate tanks held another 7 kg of helium pressurant. The Propulsion Subsystem was developed and built by Daimler Benz Aero Space AG (DASA) (formerly Messerschmitt–Bölkow–Blohm (MBB)) and provided by Germany, the major international partner in Project Galileo. At the time, solar panels were not practical at Jupiter's distance from the Sun (it would have needed a minimum of 65 square meters (700 sq ft) of solar panels). Chemical batteries would likewise be prohibitively large due to technological limitations. The solution was two radioisotope thermoelectric generators (RTGs) which powered the spacecraft through the radioactive decay of plutonium-238. The heat emitted by this decay was converted into electricity through the solid-state Seebeck effect. This provided a reliable and long-lasting source of electricity unaffected by the cold environment and high-radiation fields in the Jovian system. Each GPHS-RTG, mounted on a 5-meter long boom, carried 7.8 kilograms (17 pounds) of 238Pu. Each RTG contained 18 separate heat source modules, and each module encased four pellets of plutonium dioxide, a ceramic material resistant to fracturing. The modules were designed to survive a range of hypothetical accidents: launch vehicle explosion or fire, re-entry into the atmosphere followed by land or water impact, and post-impact situations. An outer covering of graphite provided protection against the structural, thermal, and eroding environments of a potential re-entry. Additional graphite components provided impact protection, while iridium cladding of the fuel cells provided post-impact containment. The RTGs produced about 570 watts at launch. The power output initially decreased at the rate of 0.6 watts per month and was 493 watts when Galileo arrived at Jupiter. A diagram of Galileo's main components. After Challenger, a study considered additional shielding but rejected it, in part because such a design significantly increased the overall risk of mission failure and only shifted the other risks around (for example, if a failure on orbit had occurred, additional shielding would have significantly increased the consequences of a ground impact). 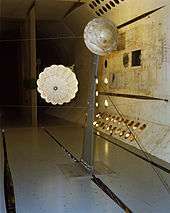 Scientific instruments to measure fields and particles were mounted on the spinning section of the spacecraft, together with the main antenna, power supply, the propulsion module and most of Galileo's computers and control electronics. The sixteen instruments, weighing 118 kg altogether, included magnetometer sensors mounted on an 11 m boom to minimize interference from the spacecraft; a plasma instrument for detecting low-energy charged particles and a plasma-wave detector to study waves generated by the particles; a high-energy particle detector; and a detector of cosmic and Jovian dust. It also carried the Heavy Ion Counter, an engineering experiment added to assess the potentially hazardous charged particle environments the spacecraft flew through, and an added Extreme Ultraviolet detector associated with the UV spectrometer on the scan platform. The despun section's instruments included the camera system; the near infrared mapping spectrometer to make multi-spectral images for atmospheric and moon surface chemical analysis; the ultraviolet spectrometer to study gases; and the photo-polarimeter radiometer to measure radiant and reflected energy. The camera system was designed to obtain images of Jupiter's satellites at resolutions from 20 to 1,000 times better than Voyager's best, because Galileo flew closer to the planet and its inner moons, and because the more modern CCD sensor in Galileo's camera was more sensitive and had a broader color detection band than the vidicons of Voyager. The following information was taken directly from NASA's Galileo legacy site. The SSI was an 800-by-800-pixel solid state camera consisting of an array of silicon sensors called a "charge coupled device" (CCD). Galileo was one of the first spacecraft to be equipped with a CCD camera. The optical portion of the camera was built as a Cassegrain telescope. Light was collected by the primary mirror and directed to a smaller secondary mirror that channeled it through a hole in the center of the primary mirror and onto the CCD. The CCD sensor was shielded from radiation, a particular problem within the harsh Jovian magnetosphere. The shielding was accomplished by means of a 10 mm thick layer of tantalum surrounding the CCD except where the light enters the system. An eight-position filter wheel was used to obtain images at specific wavelengths. The images were then combined electronically on Earth to produce color images. The spectral response of the SSI ranged from about 0.4 to 1.1 micrometres. The SSI weighed 29.7 kilograms and consumed, on average, 15 watts of power. The NIMS instrument was sensitive to 0.7-to-5.2-micrometre wavelength IR light, overlapping the wavelength range of the SSI. The telescope associated with NIMS was all reflective (using only mirrors and no lenses) with an aperture of 229 mm. The spectrometer of NIMS used a grating to disperse the light collected by the telescope. The dispersed spectrum of light was focused on detectors of indium antimonide and silicon. The NIMS weighed 18 kilograms and used 12 watts of power on average. The Cassegrain telescope of the UVS had a 250 mm aperture and collected light from the observation target. Both the UVS and EUV instruments used a ruled grating to disperse this light for spectral analysis. This light then passed through an exit slit into photomultiplier tubes that produced pulses or "sprays" of electrons. These electron pulses were counted, and these count numbers constituted the data that were sent to Earth. The UVS was mounted on Galileo's scan platform and could be pointed to an object in inertial space. The EUV was mounted on the spun section. As Galileo rotated, EUV observed a narrow ribbon of space perpendicular to the spin axis. The two instruments combined weighed about 9.7 kilograms and used 5.9 watts of power. The PPR had seven radiometry bands. One of these used no filters and observed all incoming radiation, both solar and thermal. Another band allowed only solar radiation through. The difference between the solar-plus-thermal and the solar-only channels gave the total thermal radiation emitted. The PPR also measured in five broadband channels that spanned the spectral range from 17 to 110 micrometres. The radiometer provided data on the temperatures of Jupiter's atmosphere and satellites. The design of the instrument was based on that of an instrument flown on the Pioneer Venus spacecraft. A 100 mm aperture reflecting telescope collected light and directed it to a series of filters, and, from there, measurements were performed by the detectors of the PPR. The PPR weighed 5.0 kilograms and consumed about 5 watts of power. The Dust Detector Subsystem (DDS) was used to measure the mass, electric charge, and velocity of incoming particles. The masses of dust particles that the DDS could detect go from 10−16 to 10−7 grams. The speed of these small particles could be measured over the range of 1 to 70 kilometers per second. The instrument could measure impact rates from 1 particle per 115 days (10 megaseconds) to 100 particles per second. Such data was used to help determine dust origin and dynamics within the magnetosphere. The DDS weighed 4.2 kilograms and used an average of 5.4 watts of power. The Energetic Particles Detector (EPD) was designed to measure the numbers and energies of ions and electrons whose energies exceeded about 20 keV (3.2 fJ). The EPD could also measure the direction of travel of such particles and, in the case of ions, could determine their composition (whether the ion is oxygen or sulfur, for example). The EPD used silicon solid state detectors and a time-of-flight detector system to measure changes in the energetic particle population at Jupiter as a function of position and time. These measurements helped determine how the particles got their energy and how they were transported through Jupiter's magnetosphere. The EPD weighed 10.5 kilograms and used 10.1 watts of power on average. Galileo' s Heavy Ion Counter. The HIC was in effect a repackaged and updated version of some parts of the flight spare of the Voyager Cosmic Ray System. The HIC detected heavy ions using stacks of single crystal silicon wafers. The HIC could measure heavy ions with energies as low as 6 MeV (1 pJ) and as high as 200 MeV (32 pJ) per nucleon. This range included all atomic substances between carbon and nickel. The HIC and the EUV shared a communications link and, therefore, had to share observing time. The HIC weighed 8 kilograms and used an average of 2.8 watts of power. The magnetometer (MAG) used two sets of three sensors. The three sensors allowed the three orthogonal components of the magnetic field section to be measured. One set was located at the end of the magnetometer boom and, in that position, was about 11 m from the spin axis of the spacecraft. The second set, designed to detect stronger fields, was 6.7 m from the spin axis. The boom was used to remove the MAG from the immediate vicinity of Galileo to minimize magnetic effects from the spacecraft. However, not all these effects could be eliminated by distancing the instrument. The rotation of the spacecraft was used to separate natural magnetic fields from engineering-induced fields. Another source of potential error in measurement came from the bending and twisting of the long magnetometer boom. To account for these motions, a calibration coil was mounted rigidly on the spacecraft to generate a reference magnetic field during calibrations. The magnetic field at the surface of the Earth has a strength of about 50,000 nT. At Jupiter, the outboard (11 m) set of sensors could measure magnetic field strengths in the range from ±32 to ±512 nT, while the inboard (6.7 m) set was active in the range from ±512 to ±16,384 nT. The MAG experiment weighed 7 kilograms and used 3.9 watts of power. The PLS used seven fields of view to collect charged particles for energy and mass analysis. These fields of view covered most angles from 0 to 180 degrees, fanning out from the spin axis. The rotation of the spacecraft carried each field of view through a full circle. The PLS measured particles in the energy range from 0.9 eV to 52 keV (0.1 aJ to 8.3 fJ). The PLS weighed 13.2 kilograms and used an average of 10.7 watts of power. An electric dipole antenna was used to study the electric fields of plasmas, while two search coil magnetic antennas studied the magnetic fields. The electric dipole antenna was mounted at the tip of the magnetometer boom. The search coil magnetic antennas were mounted on the high-gain antenna feed. Nearly simultaneous measurements of the electric and magnetic field spectrum allowed electrostatic waves to be distinguished from electromagnetic waves. The PWS weighed 7.1 kilograms and used an average of 9.8 watts. 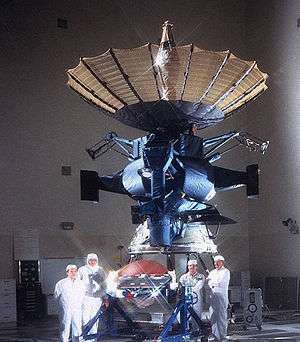 The Galileo Probe was an atmospheric-entry probe carried by the main Galileo spacecraft on its way to Jupiter. 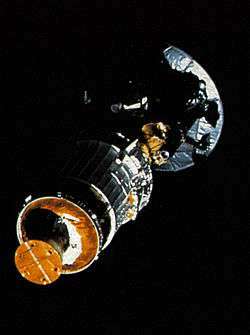 It separated from the main spacecraft in July 1995, five months before its rendezvous with the planet on 7 December. After a rough deceleration, the Descent Module started to return data to the main spacecraft hovering high above Jupiter. The 339-kilogram (747 lb) probe was built by Hughes Aircraft Company at its El Segundo, California plant, measured about 1.3 meters (4.3 ft) across. Inside the probe's heat shield, the Descent Module with its scientific instruments were protected from extreme heat and pressure during its high-speed journey into the Jovian atmosphere, entering at 47.8 kilometers (29.7 mi) per second. During the 57 minutes of data collecting, the Galileo probe returned some surprising data on Jupiter's atmospheric conditions and composition and also some new discoveries. Galileo made the first observation of ammonia clouds in another planet's atmosphere. The atmosphere creates ammonia ice particles from material coming up from lower depths. The moon Io was confirmed to have extensive volcanic activity that is 100 times greater than that found on Earth. The heat and frequency of eruptions are reminiscent of early Earth. Complex plasma interactions in Io's atmosphere create immense electrical currents which couple to Jupiter's atmosphere. Several lines of evidence from Galileo support the theory that liquid oceans exist under Europa's icy surface. Ganymede possesses its own, substantial magnetic field – the first satellite known to have one. Galileo magnetic data provide evidence that Europa, Ganymede and Callisto have a liquid-saltwater layer under the visible surface. Evidence exists that Europa, Ganymede, and Callisto all have a thin atmospheric layer known as a 'surface-bound exosphere'. Jupiter's ring system is formed by dust kicked up as interplanetary meteoroids smash into the planet's four small inner moons. The outermost ring is actually two rings, one embedded with the other. There is probably a separate ring along Amalthea's orbit, as well. The Galileo spacecraft identified the global structure and dynamics of a giant planet's magnetosphere. An image of Earth taken by Galileo during the GOPEX test, showing laser pulses coming from a transmitting telescope on the night side. Galileo's imager was panned downward during the exposure to separate the pulses, thus blurring Earth's image on the right. In December 1992, during Galileo' s second gravity-assist planetary flyby of Earth, another groundbreaking experiment was performed. Optical communications in space was assessed by detecting light pulses from powerful lasers with Galileo' s CCD. The experiment, dubbed Galileo OPtical EXperiment or GOPEX, used two separate sites to beam laser pulses to the spacecraft, one at Table Mountain Observatory in California and the other at the Starfire Optical Range in New Mexico. The Table Mountain site used a frequency doubled Neodymium-Yttrium-Aluminium Garnet (Nd:YAG) laser operating at 532 nm with a repetition rate of ~15 to 30 Hz and a pulse power (FWHM) in the tens of megawatts range, which was coupled to a 0.6 meter Cassegrain telescope for transmission to Galileo; the Starfire range site used a similar setup with a larger transmitting telescope (1.5 m). Long exposure (~0.1 to 0.8 s) images using Galileo's 560 nm centered green filter produced images of Earth clearly showing the laser pulses even at distances of up to 6,000,000 km. Adverse weather conditions, restrictions placed on laser transmissions by the U.S. Space Defense Operations Center (SPADOC) and a pointing error caused by the scan platform acceleration on the spacecraft being slower than expected (which prevented laser detection on all frames with less than 400 ms exposure times) all contributed to the reduction of the number of successful detections of the laser transmission to 48 of the total 159 frames taken. Nonetheless, the experiment was considered a resounding success and the data acquired will likely be used in the future to design laser "downlinks" which will send large volumes of data very quickly, from spacecraft to Earth. The scheme is already being studied (as of 2004) for a data link to a future Mars orbiting spacecraft. 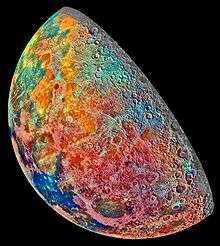 An artificially coloured mosaic constructed from a series of 53 images taken through three spectral filters by Galileo' s imaging system as the spacecraft flew over the northern regions of the Moon on December 7, 1992. Galileo' s star scanner was a small optical telescope that provided an absolute attitude reference. It also made several scientific discoveries serendipitously. In the prime mission, it was found that the star scanner was able to detect high-energy particles as a noise signal. This data was eventually calibrated to show the particles were predominantly >2 MeV electrons that were trapped in the Jovian magnetic belts, and released to the Planetary Data System. A second discovery occurred in 2000. The star scanner was observing a set of stars which included the second magnitude star Delta Velorum. At one point, this star dimmed for 8 hours below the star scanner's detection threshold. Subsequent analysis of Galileo data and work by amateur and professional astronomers showed that Delta Velorum is the brightest known eclipsing binary, brighter at maximum than even Algol. It has a primary period of 45 days and the dimming is just visible with the naked eye. A final discovery occurred during the last two orbits of the mission. When the spacecraft passed the orbit of Jupiter's moon Amalthea, the star scanner detected unexpected flashes of light that were reflections from moonlets. None of the individual moonlets were reliably sighted twice, hence no orbits were determined and the moonlets did not meet the International Astronomical Union requirements to receive designations. It is believed that these moonlets most likely are debris ejected from Amalthea and form a tenuous, and perhaps temporary, ring. 243 Ida. The bright dot to the right is its moon, Dactyl. On October 29, 1991, two months after entering the asteroid belt, Galileo performed the first asteroid encounter by a human spacecraft, passing approximately 1,600 kilometers (990 mi) from 951 Gaspra at a relative speed of about 8 kilometers per second (18,000 mph). Several pictures of Gaspra were taken, along with measurements using the NIMS instrument to indicate composition and physical properties. 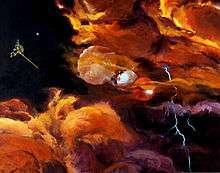 The last two images were relayed back to Earth in November 1991 and June 1992. The imagery revealed a cratered and very irregular body, measuring about 19 by 12 by 11 kilometers (11.8 by 7.5 by 6.8 miles). The remainder of data taken, including low-resolution images of more of the surface, were transmitted in late November 1992. On August 28, 1993, Galileo flew within 2,400 kilometers (1,500 mi) of the asteroid 243 Ida. 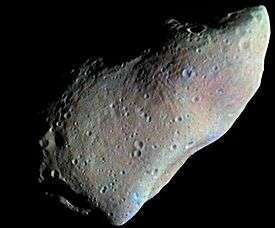 The probe discovered that Ida had a small moon, dubbed Dactyl, measuring around 1.4 kilometers (0.87 mi) in diameter; this was the first asteroid moon discovered. Measurements using Galileo's solid state imager, magnetometer and NIMS instrument were taken. From subsequent analysis of this data, Dactyl appears to be an SII subtype S type asteroid, and is spectrally different from 243 Ida. It is hypothesized that Dactyl may have been produced by partial melting within a Koronis parent body, while the 243 Ida region escaped such igneous processing. Some of the mission challenges that had to be overcome included intense radiation at Jupiter and hardware wear-and-tear, as well as dealing with the unexpected conditions of discovery. Jupiter's uniquely harsh radiation environment caused over 20 anomalies over the course of Galileo's mission, in addition to the incidents expanded upon below. Despite exceeding its radiation design limit by at least a factor of three, the spacecraft survived all these anomalies – work-arounds were found eventually for all of these problems, and Galileo was never rendered entirely non-functional by Jupiter's radiation. The radiation limits for Galileo's computers were based off data returned from Pioneers 10 and 11, since much of the design work was underway before the two Voyagers arrived at Jupiter in 1979. A typical effect of the radiation was that several of the science instruments suffered increased noise while within about 700,000 kilometres (430,000 mi) of Jupiter. The SSI camera began producing totally white images when the spacecraft was hit by the exceptional 'Bastille Day' coronal mass ejection in 2000, and did so again on subsequent close approaches to Jupiter. The quartz crystal used as the frequency reference for the radio suffered permanent frequency shifts with each Jupiter approach. A spin detector failed, and the spacecraft gyro output was biased by the radiation environment. The most severe effect of the radiation were current leakages somewhere in spacecraft's power bus, most likely across brushes at a spin bearing connecting rotor and stator sections of the orbiter. These current leakages triggered a reset of the onboard computer and caused it to go into safe mode. The resets occurred when the spacecraft was either close to Jupiter or in the region of space magnetically downstream of the Earth. A change to the software was made in April 1999 that allowed the onboard computer to detect these resets and autonomously recover, so as to avoid safe mode. Artist's impression of Galileo arriving at Jupiter. Galileo' s high-gain antenna failed to fully deploy after its first flyby of Earth. The antenna had 18 ribs, like an umbrella and when the driver motor started and put pressure on the ribs, they were supposed to pop out of the cup their tips were held in. Only 15 popped out, leaving the antenna looking like a lop-sided, half-open umbrella. Investigators concluded that during the 4.5 years that Galileo spent in storage after the 1986 Challenger disaster, the lubricants between the tips of the ribs and the cup were eroded and worn away from vibration during three cross-country journeys by truck between California and Florida for the spacecraft. The failed ribs were those closest to the flat-bed trailers carrying Galileo on these trips, which were used instead of air transport to cut costs. The antenna lubricants were not checked or replaced before launch. To fix this malfunction, engineers tried thermal-cycling the antenna, rotating the spacecraft up to its maximum spin rate of 10.5 rpm, and "hammering" the antenna deployment motor — turning it on and off repeatedly — over 13,000 times. However, all attempts failed to open the high-gain antenna. The associated problem mission managers faced was if one rib popped free, there would be increased pressure on the remaining two, and if one of them popped out the last would be under so much pressure it would never release. The second part of the problem was due to Galileo's revised flight plan. 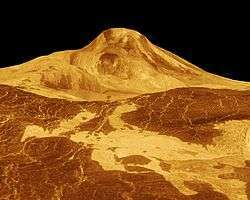 The probe had never been intended to approach the Sun any closer than the orbit of Earth, but sending it to Venus would expose it to temperatures at least 50 degrees higher than at Earth distance. So the probe had to be protected from that extra heat, part of which involved adapting some of the computer functions. Forty-one drivers had been programmed into the computer, but with no room for any more, the mission planners had to decide which driver they could use in association with the heat protection. They chose the antenna motor reverse driver. Even with the dry grease at the antenna rib tips, had the antenna motor been able to run backwards, as well as forwards, the ribs would have eventually popped out. Fortunately, Galileo possessed an additional low-gain antenna that was capable of transmitting information back to Earth, although since it transmitted a signal isotropically, the low-gain antenna's bandwidth was significantly less than the high-gain antenna's would have been; the high-gain antenna was to have transmitted at 134 kilobits per second, whereas the low-gain antenna was only intended to transmit at about 8 to 16 bits per second. Galileo' s low-gain antenna transmitted with a power of about 15 to 20 watts, which, by the time it reached Earth, and had been collected by one of the large aperture (70 m) DSN antennas, had a total power of about −170 dBm or 10 zeptowatts (10 × 10−21 watts). Through the implementation of sophisticated technologies, the arraying of several Deep Space Network antennas and sensitivity upgrades to the receivers used to listen to Galileo' s signal, data throughput was increased to a maximum of 160 bits per second. By further using data compression, the effective data rate could be raised to 1,000 bits per second. The data collected on Jupiter and its moons was stored in the spacecraft's onboard tape recorder, and transmitted back to Earth during the long apoapsis portion of the probe's orbit using the low-gain antenna. At the same time, measurements were made of Jupiter's magnetosphere and transmitted back to Earth. The reduction in available bandwidth reduced the total amount of data transmitted throughout the mission, although 70% of Galileo' s science goals could still be met. An artist's impression of the Galileo probe descending into Jupiter's atmosphere. The failure of Galileo' s high-gain antenna meant that data storage to the tape recorder for later compression and playback was absolutely crucial in order to obtain any substantial information from the flybys of Jupiter and its moons. In October 1995, Galileo' s four-track, 114-megabyte digital tape recorder, which was manufactured by Odetics Corporation, remained stuck in rewind mode for 15 hours before engineers learned what had happened and sent commands to shut it off. Though the recorder itself was still in working order, the malfunction possibly damaged a length of tape at the end of the reel. This section of tape was subsequently declared "off limits" to any future data recording, and was covered with 25 more turns of tape to secure the section and reduce any further stresses, which could tear it. Because it happened only weeks before Galileo entered orbit around Jupiter, the anomaly prompted engineers to sacrifice data acquisition of almost all of the Io and Europa observations during the orbit insertion phase, in order to focus solely on recording data sent from the Jupiter probe descent. In November 2002, after the completion of the mission's only encounter with Jupiter's moon Amalthea, problems with playback of the tape recorder again plagued Galileo. About 10 minutes after the closest approach of the Amalthea flyby, Galileo stopped collecting data, shut down all of its instruments, and went into safe mode, apparently as a result of exposure to Jupiter's intense radiation environment. Though most of the Amalthea data was already written to tape, it was found that the recorder refused to respond to commands telling it to play back data. After weeks of troubleshooting of an identical flight spare of the recorder on the ground, it was determined that the cause of the malfunction was a reduction of light output in three infrared Optek OP133 light emitting diodes located in the drive electronics of the recorder's motor encoder wheel. The GaAs LEDs had been particularly sensitive to proton-irradiation-induced atomic lattice displacement defects, which greatly decreased their effective light output and caused the drive motor's electronics to falsely believe the motor encoder wheel was incorrectly positioned. Galileo' s flight team then began a series of "annealing" sessions, where current was passed through the LEDs for hours at a time to heat them to a point where some of the crystalline lattice defects would be shifted back into place, thus increasing the LED's light output. After about 100 hours of annealing and playback cycles, the recorder was able to operate for up to an hour at a time. After many subsequent playback and cooling cycles, the complete transmission back to Earth of all recorded Amalthea flyby data was successful. 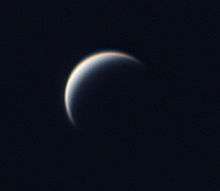 The atmospheric probe deployed its parachute fifty-three seconds later than anticipated, resulting in a small loss of upper atmospheric readings. This was attributed to wiring problems with an accelerometer that determined when to begin the parachute deployment sequence. Two years of Jupiter's intense radiation took its toll on the spacecraft's systems, and its fuel supply was running low in the early 2000s. Galileo had not been sterilized prior to launch and could have carried bacteria from Earth. Therefore, a plan was formulated to send the probe directly into Jupiter, in an intentional crash to eliminate the possibility of any impact with Jupiter's moons and prevent a forward contamination. 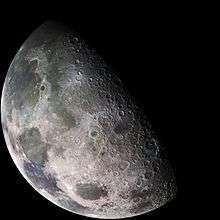 Galileo flew by Amalthea on November 5, 2002, during its 34th orbit, allowing a measurement of the moon's mass as it passed within 163.0 kilometers (101.3 mi) ± 11.7 kilometers (7.3 mi) of its surface. On April 14, 2003, Galileo reached its greatest distance from Jupiter for the entire mission after orbital insertion, 26,000,000 kilometers (16,000,000 mi), before plunging back towards the gas giant for its final impact. At the completion of its 35th and final circuit around the Jovian system, Galileo impacted the gas giant in darkness just south of the equator on September 21, 2003, at 18:57 GMT. Its impact speed was approximately 173,736 kilometers per hour (107,955 mph). The total mission cost was about US$1.4 billion. The four largest moons of Jupiter, as imaged by Galileo. Galileo captures a dynamic eruption at Tvashtar Catena, a chain of volcanic bowls on Jupiter's moon Io. NASA Juno spacecraft, launched in 2011 and planned for a two-year tour of the Jovian system, successfully completed Jupiter orbital insertion on July 4, 2016. 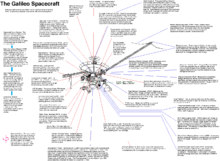 There was a spare Galileo spacecraft that the Europeans considered using for a mission to Saturn, however this was passed over in favor of a newer design which became the Cassini (spacecraft). Even before Galileo concluded, NASA considered the Europa Orbiter, which was a mission to Jupiter's Moon Europa but it was canceled in 2002. The ESA also is planning to return to the Jovian system with the Jupiter Icy Moons Explorer (JUICE), which is designed to orbit Ganymede in the 2020s. There have been several other attempts at missions that were either dedicated to, or included the Jupiter system as part of their mission plan but did not make it out of the planning stages. Following the cancellation of Europa Orbiter, lower-cost versions were studied, initially named Europa Clipper. These studies led to the Europa Multiple Flyby Mission which was approved in 2015 and is currently planned for launch in the mid-2020s. Investigators and researchers came from the following institutions, and included famous scientists such as Carl Sagan and James Van Allen. ↑ Galileo Gunter's Spcae Page. Retrieved 11 May 2016. 1 2 3 4 "Galileo End of Mission Press Kit" (PDF). Retrieved 2011-05-15. ↑ Report on Space Science. Space Studies Board. 1968. OCLC 254442711. 1 2 3 Tomayko, James E. (March 1988). "Computers in Spaceflight: The NASA Experience". NASA History Office. Retrieved November 7, 2012. ↑ Why We Explore. NASA.gov. 29 May 2007. Retrieved 12 November 2012. 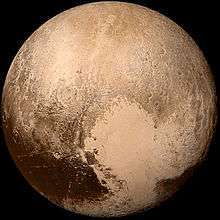 ↑ Solar System Exploration – Galileo. NASA. Retrieved 2012-04-24. 1 2 Cook, Jia-Rui c. (December 11, 2013). 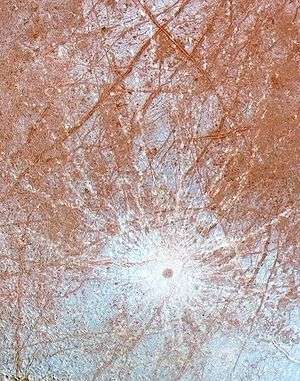 "Clay-Like Minerals Found on Icy Crust of Europa". NASA. Retrieved December 11, 2013. ↑ Siewiorek, Daniel (1998). Reliable Computer Systems. Natick, Massachusetts, USA: A K Peters. p. 683. ISBN 1-56881-092-X. ↑ Engineering Archived June 13, 2008, at the Wayback Machine. 1 2 "What's in an RTG?". .jpl.nasa.gov. Retrieved 2011-05-15. ↑ "Solar System Exploration: ''Galileo'' Legacy Site". Galileo.jpl.nasa.gov. Retrieved 2011-05-15. ↑ "SSI – Solid State Imaging". .jpl.nasa.gov. Retrieved 2011-05-15. ↑ SSI Imaging Team site. 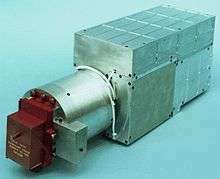 ↑ "NIMS – Near-Infrared Mapping Spectrometer". .jpl.nasa.gov. Retrieved 2011-05-15. ↑ "EUVS – Extreme Ultraviolet Spectrometer". .jpl.nasa.gov. Retrieved 2011-05-15. ↑ "PPR – Photopolarimeter-Radiometer". .jpl.nasa.gov. Retrieved 2011-05-15. ↑ "DDS – Dust Detector Subsystem". .jpl.nasa.gov. Retrieved 2011-05-15. ↑ "EPD – Energetic Particles Detector". JPL. Retrieved 2011-05-15. ↑ "HIC – Heavy Ion Counter". .jpl.nasa.gov. Retrieved 2011-05-15. ↑ "MAG – Magnetometer". .jpl.nasa.gov. Retrieved 2011-05-15. ↑ "PLS – Plasma Subsystem". .jpl.nasa.gov. Retrieved 2011-05-15. ↑ "PWS – Plasma Wave Subsystem". .jpl.nasa.gov. Retrieved 2011-05-15. ↑ "Galileo PWS". UIowa.edu. Retrieved 4 December 2012. ↑ "Hughes Science/Scope Press Release and Advertisement, retrieved from Flight Global Archives May 23, 2010". flightglobal.com. Retrieved 2011-05-15. ↑ C. Sagan; W. R. Thompson; R. Carlson; D. Gurnett; C. Hord (1993). "A search for life on Earth from the Galileo spacecraft". Nature. 365 (6448): 715–721. Bibcode:1993Natur.365..715S. doi:10.1038/365715a0. PMID 11536539. ↑ "GOPEX SPIE 1993 (Edited)" (PDF). Retrieved 2011-05-15. ↑ "NASA To Test Laser Communications With Mars Spacecraft". Space.com. 2004-11-15. Retrieved 2011-05-15. ↑ "Science with The Galileo Star Scanner". Mindspring.com. Retrieved 8 December 2012. ↑ "IBVS 4999 (7 December 2000)". Konkoly.hu. Retrieved 2011-05-15. ↑ Fieseler, P. D.; Adams, O. W.; Vandermey, N.; Theilig, E. E.; Schimmels, K. A.; Lewis, G. D.; Ardalan, S. M.; Alexander, C. J. (2004). "The Galileo star scanner observations at Amalthea". Icarus. 169 (2): 390. Bibcode:2004Icar..169..390F. doi:10.1016/j.icarus.2004.01.012. ↑ Veverka, J.; Belton, M.; Klaasen, K.; Chapman, C. (1994). "Galileo's Encounter with 951 Gaspra: Overview". Icarus. 107 (1): 2–17. Bibcode:1994Icar..107....2V. doi:10.1006/icar.1994.1002. ↑ Tomayko, James (1988). Computers in Spaceflight: The NASA Experience. NASA History Office. p. 200. ↑ "Instrument Host Overview". NASA. 1999. Retrieved 29 November 2012. 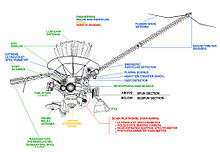 ↑ "''Galileo'' FAQ – ''Galileo'''s Antennas". .jpl.nasa.gov. Retrieved 2011-05-15. ↑ Galileo’s Telecom Using The Low-Gain Spacecraft Antenna (PDF). NASA/JPL, 1996 (cached). Retrieved 2012-01-29. ↑ "''Galileo'' FAQ – Tape Recorder". .jpl.nasa.gov. Retrieved 2011-05-15. ↑ David M. Harland (1 October 2000). Jupiter Odyssey: The Story of NASA's Galileo Mission. Springer Science & Business Media. pp. 105–. ISBN 978-1-85233-301-0. ↑ Galileo Legacy Site. NASA, 2010. Retrieved 2012-04-24. ↑ Peter Bond, Spaceflight Now, 21 September 2003. ↑ Kathy Sawyer (17 December 1991). "Galileo Antenna Apparently Still Stuck". Washington Post: A14; Kathy Sawyer (18 December 1991). "$1.4 Billion Galileo Mission Appears Crippled." Washington Post: A3 in Mission to Jupiter. p.180. ↑ Galileo: Facts & Figures. NASA.gov. Retrieved 12 November 2012. ↑ "NASA's Shuttle and Rocket Launch Schedule". NASA. Retrieved February 17, 2011. Wikimedia Commons has media related to Galileo mission. Italics indicates active current missions. † indicates failure en-route or before any data returned. Italics indicate active current missions.